The Cocoa Touch is an UI (user interface) framework that runs on iOS for the iPhone, iPod Touch, and iPad, watchOS for the Apple Watch and tvOS for the Apple TV and so on. 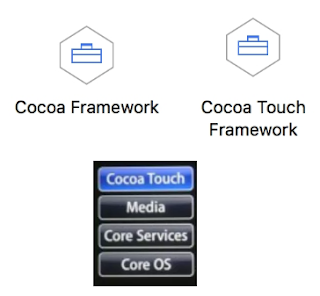 The Cocoa Touch helps us to create rich user experiences by allowing for the smooth movement of visual elements and iOS, watchOS, and tvOS technologies can be seen as a set of layers, with Cocoa Touch at the highest level and the Core OS/kernel at the bottom. The Cocoa Touch also provides an abstraction layer of iOS. The Cocoa is a object oriented software libraries, application environment and a runtime system that helps us to develop OSX and iOS apps using Swift language and Objective C.
What are Cocoa Touch key frameworks for developing applications? What are the differences between cocoa touch and cocoa? Cocoas touch is an application framework for Apple products like iPad, iPhone and iPod Touch. Cocoa is an application framework that helps in the development of applications in MAC OS X environment. Both Cocoa and Cocoa Touch sit on top of other collections of frameworks to create the API stacks. 1. Cocoa is the application framework for Mac OS X. 2. Cocoa Touch is the application framework for iPhone and iPod Touch. What does cocoa touch offers? Cocoa touch supports event-driven behavior that helps in managing applications, windows, and workspaces. Cocoa has a user interface objects like windows, buttons, tables, etc. These features can drag and dropped from interface builder and its code created automatically. What is the meaning of core data? Core data is a framework that helps to managing graphs and persistent storage. What are the performance tools available for cocoa application development? XCode is the engine that powers Apple’s IDE (integrated development environment) for OSX and iOS. What are the important classes in cocoa? What Frameworks those make Cocoa? What are the differences between Copy and mutableCopy? 1. Copy always creates an immutable copy. 2. Mutable Copy always creates a mutable copy. What are the differences between alloc and new? The alloc creates a new memory location but doesn’t initialize it as compared to new. What are the differences between release and pool drain? The release frees a memory. The drain releases the NSAutoreleasePool itself. What are the differences between @property and @synthesize? The @property - declares a property. What are the Relation between iVar and @property? The iVar are just instance variables. It can't be accessed unless we create assessors, which are generated by @property.